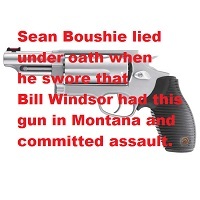 On August 13, 2013, Sean Boushie signed a sworn affidavit before a notary, and he swore that Bill Windsor had a gun and was carrying in on his person. He further claimed that Bill Windsor claimed he was carrying a firearm. The false sworn affidavit was used to get William M. Windsor arrested and jailed for 134 days. “Bill Windsor currently possesses a firearm." "Bill Windsor's firearm is on his person." "Bill Windsor claims to be carrying a firearm. This is absolutely false, and Sean Boushie published statements in which he acknowledged that Bill Windsor did not have a gun. As William M. Windsor has said before and will be happy to say while connected to a polygraph, he did not take a gun to Montana in August 2013 or at any time, and he never said he claimed to be carrying a firearm. William M. Windsor made this known to Judge Sam Warren and Missoula County Montana Judge John W. Larson in Exhibit 41 in the folder named Missoula Montana Criminal case, the Motion for Modification, ¶¶17 and 30. The Affidavit of William M. Windsor dated january 16, 2015 includes two published statements where Sean Boushie notes that William M. Windsor published that he did not have a gun, paragraphs 638 (“First he said he no longer carried his judge gun.”) and 642 (“I thought he got rid of his little gun….”). These lies are what enabled Sean Boushie to attempt to obtain a Temporary Order of Protection against Bill Windsor on August 13, 2013. 3. Obtain University of Montana server logs for all posts listed above that were sent during work hours for Sean Boushie. 5. Sean Boushie admits in Joeyisalittlekid.blogspot.com that he is both John Smith and TinyFeetNhands. Ask him. If he admits it, you have the evidence needed. If he denies it, prove he lied with the evidence from Google (Blogspot) and Joeyisalittlekid. 6. Call Bill Windsor's ex-wife, and she will confirm that she had the gun in her home. 7. Ask Sean Boushie when he was ever close enough to Bill Windsor to see if he had a gun. Bill Windsor has never been around Sean Boushie except on March 27, 2015 when Sean Boushie sat in the courtroom laughing at him and pointing his finger at Bill Windsor as if his hand was a gun. 8. See the articles online where Bill Windsor states that he does not have a gun. July 23, 2013 Article and the others linked above.